Greetings from SW North Dakota. I had some problem with blight the past few years. I was told to place clear plastic in the latter part of the summer in the area where you plan to grow tomatoes the following year. l staked down the plastic and checked the soil temperature under the plastic on a regular basis. The logic of this…(if there is any) was to heat the soil to a temp of 100 degrees+ for at least 30 days and this is supposed to kill the blight spore that causes the blight problem. This is the first year that I have tried this so I cannot give you any synopsis of results. I will know more about the success of this process after next year’s growing season. I am looking for a good method to control this devastating disease. First…I am super impressed that you are writing from North Dakota. Thanks for reading our column! As far as controlling late blight – last summer WNC experienced record rainfalls and the area was devastated by late blight. Check out our recent article on late blight, and these great photos of late blight. One additional note (since some of us in WNC will be planting potatoes in March)…be sure to remove any and all volunteer potatoes that come up in your garden – as a preventative measure against late blight. It can work on a farm-scale or on a small garden-scale, and sounds like it may be worth the effort! The solarization process will take 4-6 weeks, possibly 8 weeks. Heating can occur as deep as 18 inches with soil temperatures reaching 90-98 degrees at that depth. The soil temps will be around 108-131 degrees at 2” deep, and temps can reach up to 140 degrees in the top 6 inches. Most of the benefits of the solarization process will be realized in the first 6 inches of soil. The maximum benefits of solarizing your soil will be obtained in the first 3-4 months right after the plastic has been removed. Over time, weed seeds will be blown back into the area and pests will work their way back too. The area to be solarized is best laid out in a north/south orientation to maximize sun exposure. Remove or thoroughly till in any crop residue. Remove any clumps, rocks, debris, or sprouted weeds and rake out the soil surface to create a soil surface that is a smooth as possible. You may need to “crown” the soil slightly so that water will drain off the plastic (puddles won’t allow for light transmission). You want excellent contact between the soil and the plastic, and you don’t want the plastic to tear. Some research implies that incorporation of soil amendments, manures, crop residues, and cover crops prior to solarization will bring increased fertility benefits afterwards. Solarization speeds decomposition and increases soluble nutrients. Remember that after incorporation, you want the soil surface to be as smooth as possible before the plastic is applied so that there is good contact with the soil. If you are planning to bed-up an area, do so prior to solarization – so that you don’t contaminate the bed with surrounding untreated soil after solarization. Moisten the soil if needed. The soil should be adequately moist, but not wet or swampy. Do not create puddles. Moist soil achieves your objective of killing the bad guys better than dry soil. Remove drip irrigation tape, and anything else that might melt in the heat, before spreading the plastic over the area to be treated. Spread your plastic over the area. You will need enough plastic to cover the entire area plus enough extra on all four sides to be weighted down with soil. Your plastic must be clean. Muddy/dirty plastic will not allow light transmission and will prevent good solarization. Dig a trench around the perimeter for the plastic edges. Secure the plastic with soil on the windward side first. Then pull the plastic tight on the opposite side and secure well with soil. Then secure the ends. You do not want wind to blow your plastic off – so do a good job or your heat build-up will be lost. For best results use 1.5 and 2 mil. clear plastic that is UV resistant. Surprisingly, clear plastic creates more heat than black or any other color plastic. Builder’s plastic or painter’s plastic drop cloths could be used, but they may disintegrate before solarization is complete, so greenhouse plastic is a better choice. A double layer of plastic can be used in cooler climates. This will raise the temps by 2-10 degrees. Separate the layers slightly with something, like a PVC pipe. Any tears or holes in the plastic should be repaired with duct tape. Greenhouse repair tape could work also. Wind, birds, and other animals can cause holes – so check your plastic routinely and make repairs if needed. Don’t walk on the plastic for the same reason. 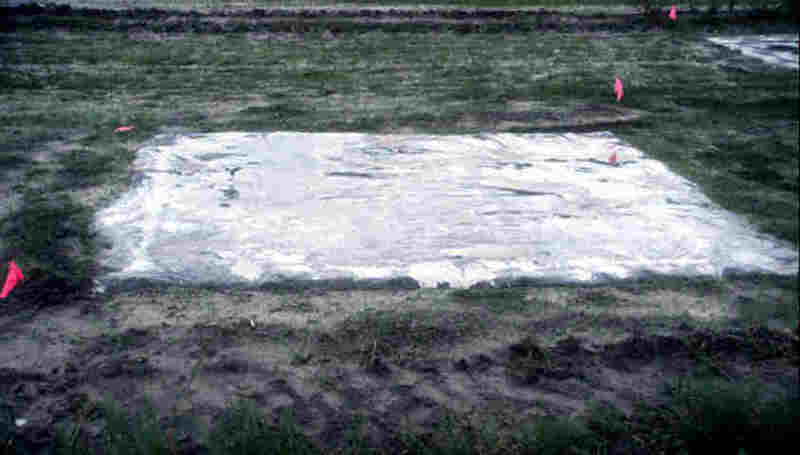 When removing the plastic, avoid contaminating the newly solarized soil with the adjacent soil. Good news! Even though solarization probably kills the benefical microorganisms, they are able to re-populate more quickly than the pathogens. Post-solarization conditions actually favor and select for beneficial microorganisms, including mycorrhizal fungi. Solarization may improve tilth also. What about earthworms? It is assumed that they retreat from the area before they are affected by the heat. What about perennial weeds? Solarization should kill most annual and perennial weed seeds, but it probably does not control perennials with deep roots or rhizomes (like Johnson grass)…but it may slow them down. Consider using this technique prior to sowing a lawn for control of weeds. Err on the side of caution. 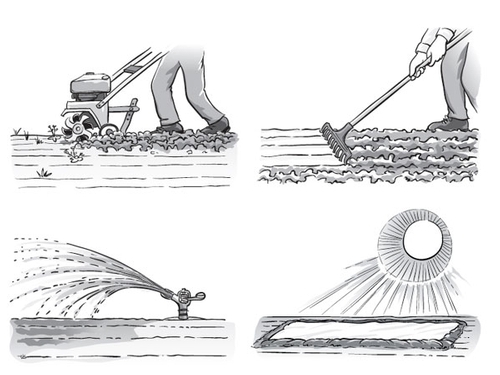 After solarization, try not to cultivate any deeper than 2-3” to avoid bringing any lingering weed seeds and pathogens to the surface. Leaving the plastic in place more than 8 weeks could be detrimental. The environmental impact of disposing of large pieces of plastic should be considered before undertaking this project. So folks, now you have the steps needed to solarize a portion of your garden, plus a youtube demo of the process. U.S., I am curious to hear about the results in your garden. Just a thought…setting up your solarization area earlier in the summertime should be helpful in achieving higher soil temperatures. Will you please report back to us and let us know how your solarization experiment went this year? Thanks again for writing all the way from SW North Dakota and good luck with the blight!